In today's market it can be very difficult to find quality benefits at reasonable prices. MediGuard360 is the solution you've been searching for. It includes discounts for Prescriptions, Dental, Vision, Labs... Even access to 24/7 consultations with doctors and more! MediGuard360 is a unique and powerful set of benefits. And, we are able to keep it priced at less than $100 per month. Utilizing the Doctor benefits, Members can enjoy broad access to nearly 1,200 hospitals, 60,000 ancillary facilities and more than 400,000 healthcare professionals. With MediGuard360, you have access to a doctor 24/7/365. We've included the Teladoc® Unlimited benefit so you can call and speak with a doctor any time, from any location. You can use MediGuard360 at any number of over 65,000 Select Pharmacies nation wide. If you prefer, you can also take advantage of our convenient mail order program and have them sent right to your doorstep! Members will have access to networks of thousands of participating providers in the country. You can receive discounts on dental, vision, hearing, labs, and much more. Learn Even More Sign Up Now! MediGuard360 is a different kind of discount health program. We designed it from the ground up to make it enjoyable to use your benefits. I missed the open enrollment deadline and MediGuard360 was the perfect thing to hold me over until I could get insurance. I broke my wrist and didn't have any insurance, only MediGuard360. Turns out, the Patient Advocacy portion was able to reduce my bill by 65%. Thanks! I saved 50% on my son's dental procedure when he chipped a tooth playing basketball. Also, the customer support team was very helpful during the process! MediGuard360 saves me money every single month when I go to get my prescription filled. Last month I saved $78! 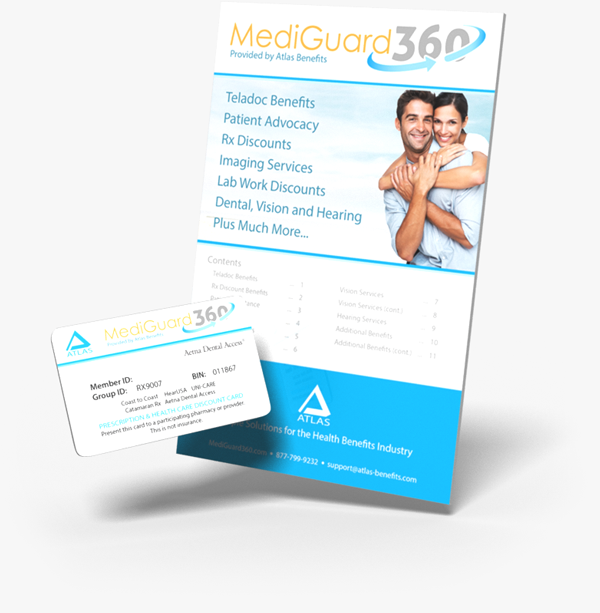 MediGuard360 is a unique set of benefits designed to save you money on your healthcare expenses. It was designed from the ground up with people like you in mind who are looking for a quality set of benefits at a price point that is under $100 per month. You will enjoy the following benefits with your MediGuard360 program, in addition to many others! Save time and money by utilizing the Teladoc® services included in your membership. Includes both walk-in pharmacy benefits and mail-order benefits for your convenience. Patient Advocates will work directly with providers to reduce medical bills. Take care of you and your loved ones' healthy smiles by enjoying discounts on dental services. Members can save 10% - 60% off eyeglasses, contact lenses, and other retail eyewear items. They can also save 10% - 30% off eye examinations and 17% - 40% on the cost of brand name hearing aids. Members can save on imaging needs such as MRIs, CT Scans, and X-Rays. ** As of August 2015. * There is a one-time enrollment fee that will apply for your first month's payment in addition to your monthly dues. ** MA is available, but only without the Valuepoint by MultiPlan upgrade. Our goal is to provide you with an amazing experience as you become a member of the MediGuard360 family. Have a question about MediGuard360? Contact us by using the form or call directly to speak with us. E-mail Instructions on how to reset your password will be sent to the email provided.